Peridot is treasured as the National gem of Egypt, and their love of this gemstone dates back to the ancient Egyptians whom referred to Peridot as “The Gem of the Sun.” Many believed that it protected its owner from night terrors and bad dreams. Early records indicate that the ancient Egyptians discovered a deposit of Peridot on an island in the Red Sea called Topazios, now known as St. John’s Island or Zabargad. The island was closely guarded, as they mined Peridot to be given to the Pharaoh. Peridot was also included in the phenomenal tombs discovered of ancient Egyptian Pharaohs, who believed that they could take their treasures with them into the afterlife. It is even believed by some that Cleopatra’s famous “emeralds” were in fact Peridot, as the stone was not often identified properly, often being confused for emerald or topaz. In fact, Peridot is often called “the Evening Emerald” due to its brilliant green glow under artificial light. 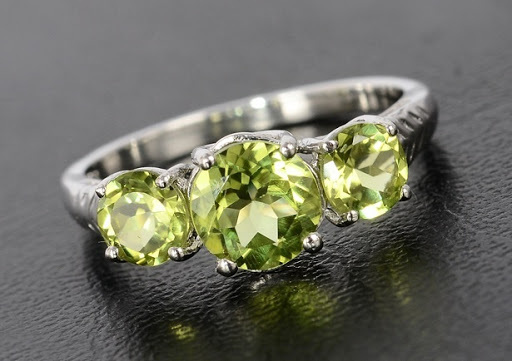 Peridot is one of the few and rare gemstones which exist only in one color. Its coloring agent is iron, which accounts for the deep green color with a slight golden hue. The color as such can come in multiple variations from a pale yellow-green to a deep olive green. Peridot often influences fashion trends as well, signifying the looks of nature with its varying shades of green. Perhaps this is why the beautiful greens of Peridot can be worn with anything from casual day wear to elegant evening attire. 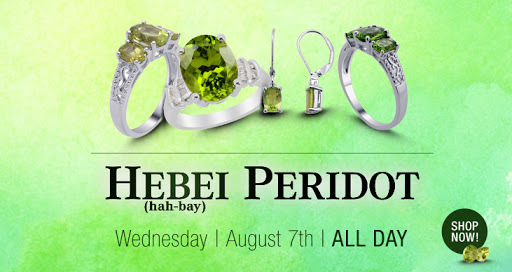 The Liquidation Channel is excited to offer our LC family the fantastic Hebei Peridot with the Exceptional Quality, Exquisite Design, and Outstanding Value you’ve come to expect from us here at LC.